Recall the simple job characteristic paradigm I suggested last time. Unfortunately, the real world seems to be bearing this out. You have likely read that, during the current anemic economic recovery, middle wage to higher wage jobs have apparently been lost (interpret that as jobs that have a moderate to high price, but involve little creativity while they may be complex or routine—thus they are vulnerable to replacement by a machine or software). 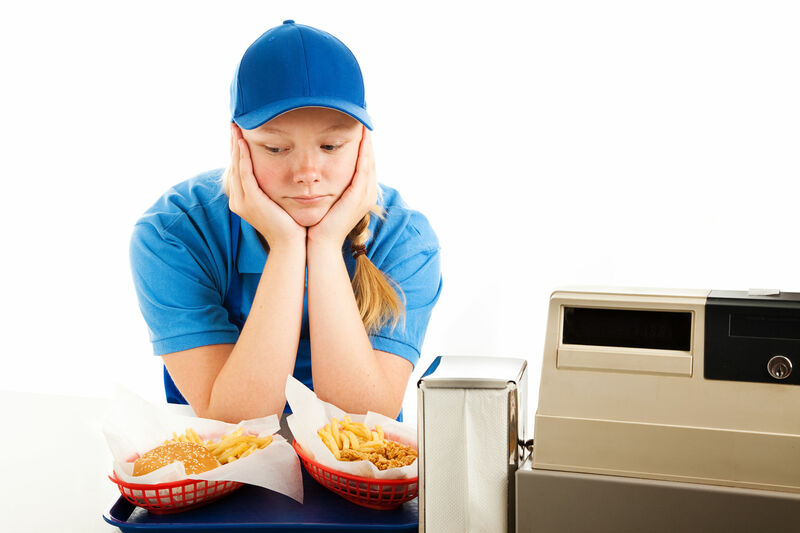 The fastest growing sector in new jobs by far is the fast food industry. Here again is a sector of the economy that is currently fairly labor-intensive, but in which jobs are simple, lacking in creativity, and low price. Thus, it might seem a fairly low risk alternative for technological substitution of capital for labor. The fact that this is where the greatest number of jobs are being currently created is not lost on politicians. To them, it appears a good place to cultivate and capture voters by over-riding the market and offering rewards. That is the essence of “public choice theory.” The idea that politicians will tend to steal or expropriate from those who voted against them in order to reward those who voted for them. The problem is that when the market is subverted by politics, the consequences are often not what the political architects intended. Currently, the Obama administration has attempted to attract attention by announcing its support for a minimum wage of $15/hour for fast food workers. At first glance, those of us with a weak foundation in the working of the marketplace, may applaud the idea of a guaranteed higher living-wage for fast food workers. Employers might look at it a little differently. With new health care mandates, higher cost unemployment insurance and, now, higher hourly wage costs for their employees as well, they may see the attraction of a new, alternative production technique. There are many ways to skin the cat of producing a burger and fries. Which one is preferred in a competitive marketplace? The one that minimizes total costs of production while making final consumers happy. Put bluntly, fast-food employers only chose a low-skilled, labor-intensive technique because the cost of labor was less than the cost of automating. Now, as a result of higher costs mandated by government or bureaucrats, that may have changed. “We can substitute capital to achieve automated food preparation, increase touch screens for customers, and meet customers’ human interaction preferences with cheerful host/managers. These higher-skilled employees can then deal with any software and hardware problems that may arise. Moreover, they will be far friendlier and easier for customers to deal with than the mix of surly teenagers, early parolees, or inarticulate speakers we used to employ. Individually they will cost more,but we can get by with fewer of them. As a result, we can produce an improved product and experience for a customers with 1 or 2 employees per franchise, rather than the 8-12 lesser skilled employees we used to depend on.” Hence, an unintended consequence of $15/hour minimum wage in the fast food industry could be to sharply reduce jobs in that sector. Once again evidence that politicians don’t understand economics. The more cynical amongst us may be forgiven for believing that politicians do understand the economic consequences of their policies, but they simply don’t care—the legislated minimum wage was just done for political effect – “window dressing” for the uninformed. This outcome is kind of sad because many, if not most, fast-food workers were likely not planning on a long-term career in the industry. Rather, it was viewed as the available first rung of job experience. A chance to develop for low-skilled, entry level employees or teenagers, on their way to more lucrative careers. Consider the substitution of capital for labor in another low-skilled food sector. Over the past 200 years technology has slowly replaced small farmers and farm workers in the U.S. and has changed the optimal economic scale of a farm. Although some agricultural activities are still labor intensive, the substitution of capital for labor will likely accelerate. Why? After all, described in terms of our three job attributes, farm work is typically fairly simple, uncreative, and lowly paid (the recent wage average in the U.S. is about $9/hour). A low average wage would tend to insulate this sector somewhat from immediate or accelerated technological substitution. However, there are indirect costs to employers. First, there are regulatory costs and the risk of legal sanctions against those who hire illegal immigrants as farm workers. For employers avoiding this risk is desirable. Especially as the bureaucratic complexity and indirect cost of hiring any worker in the U.S. economy steadily increases. Secondly, militancy and unionization of farm workers in order to demand better work conditions and pay will likely have the ironic effect of actually accelerating their replacement by machines and technology. Development of GPS and computer guided tractors and farm machinery has reached the point where planting, fertilization, thinning and weeding, picking, and primary processing of many crops can now be accomplished by equipment that substitutes for unskilled or low-skilled labor. This machinery may be expensive but it is available. Its productivity is rising and its cost per unit of output is falling. Not surprisingly, the adoption of it is increasing. Final consumers know of farm-workers but in most cases they do not know or interact with them personally. Most employers of farm workers probably look on farm-workers as a necessary evil, required only so long as they can’t be profitably replaced by a cheaper, capital-intensive production technique. The health sector in the U.S. is now morphing from an already heavily-regulated oligopolistic industry to one arguably now totally controlled and paid for (by us of course) through taxation by the government sector. Thus, health care is apparently on its way to becoming a sector where market forces will not be primary in determining supply, demand or production. That is, one with political criteria and mandates applied to its practitioners and beneficiaries. This change hasn’t been lost on the cottage industries of would-be new purveyors of health care to the patient. They were waiting in the wings ready to rise. For the most opportunistic of them, it is now raining soup. To the naïve patient, of course, it seems as though it’s all free—paid for by the government! If you now incur an illness or injury, you are may be surprised and perhaps flattered by the size and scope of the “team” that is ready to deal with it. For example, let’s say you are suffering the after-effects of a concussion. You will likely encounter a psychologist, a social worker or sociologist, a physiatrist, a physical therapist, an occupational therapist, an activity therapist, a chiropractor, a neurologist, an ophthalmologist, a speech therapist and perhaps even a phrenologist, an acupuncturist or an herbalist. You might wonder why all these wonderful, well-meaning folks are necessary to work for you. Why is the “team” so large? They are here because they were able to elbow and winnow their way to a seat at the crowded table and because the government is not a particularly discriminating buyer with your money. Politicians, of course, realize they are buying votes and economic leverage, not services. After dealing your team for a while, you may discover a sad fact. The actual communication level amongst the “team” may be surprisingly low as is the actual quality of the health care you receive. Missing, may be the sharply intuitive diagnostician or perceptive, bright physician we sometimes were lucky enough to have as our personal doctor. That person may still be there somewhere, or they may have gotten fed up and retired from the medical profession to develop real estate. Alas our national healthcare may appear to have boarded some non-market crazy train. However, have some optimism and faith. This path toward national healthcare has been traveled by many other societies and the widespread discovery is that the market is not so easily suppressed. In fact, the term “non-market sector” may be one we should generally avoid. The “market” always tends to re-emerge in one way or another – especially in such a critical sector as health. If you have a minor injury or minor complaint, you likely deal with the irritating bureaucracy and the barrier of semi-competent practitioners. If you have a serious health problem, you seek out the “A-team” practitioners and specialists who are highly competent– insightful, creative, and expensive. The supply and demand for these folks will still be market-determined. Of course, the sad thing about a national healthcare system is that it will be more bureaucratic, clunky, and expensive than it needs to be. You will be paying for your healthcare at least twice. To those who respect the working and efficiency of free, private markets, the replacement of drudgery, work, or jobs by technology is an inevitable and desirable outcome. It is the only way in which a society may enjoy an increase in productivity and its standard of living. Development of productive capital and its employment has unimaginably increased the output of a single human. Ultimately, all of us would like to be put out of the part of our jobs that is tedious, repetitive or physically hard. Most of us enjoy or prefer work that is creative, productive and well-compensated. Some of us who have worked in the past and taken risk to own productive capital, prefer to vacation. In common with our ancestors, “work” is something to be minimized in order to produce well-being and leisure. Where government has politically intervened in this process, we usually have been saddled with an inferior outcome—where the public sector has sought to create “a village.” The story is familiar and dismal. The post office? About it, little needs to be said. The regulated communication industry? A bright spot, perhaps. Smart-phones and the internet stand as a shining example that regulation can sometimes be reversed and when it is the results can be fantastic. If that industry was still regulated as it was, we all might still be talking to each other on “princess” phones and the post office might still appear relevant. Finance and banking? That sector along with much of the legal industry may define exactly what we mean by “stuffed shirt” purveyors of arcane information, otherwise of little real substance. We are close to the heart of those who subsist by getting “between the wallpaper and the wall.” When you think you might need the insight of one of these people, it seems a good time to “Ask Google.” Do you really need some financial advisor to churn your stock account or show you a simple, canned pie chart about how to allocate your assets for retirement? Read our book, Capital as Money, to get our view on the hardship wrought on the economy by central bankers, bankers and a seriously flawed, unnecessary system of money and credit. Do we need a private monetary system? More than ever. (Answer that question again, after you experience the fiat money inflation coming in the next few years—we currently have a relic of a Chairperson of the Federal Reserve who actually thinks that inflation is caused by “wage-push!” What’s next? More Japanese soldiers emerging from the jungles of the Philippines, convinced that WWII is still on?) Is private money technologically feasible? You bet! Transportation? Improvement in computer technology has allowed us to use far fewer air traffic controllers than we needed before. We are in sight of the capability to remotely pilot most planes and vehicles. This technological capability may sharply reduce the risk of terrorism from that direction, at least, and could lead to more fruitful employment of the 55,000 individuals currently working within the TSA bureaucracy. How much longer does every car, taxi, bus, truck, or train have to be monotonously driven by a bored, numbed individual? Education? Does your child benefit from the Department of Education and its political agendas? Along with its duplicate in all 50 states coupled with a public teachers’ union. Compare that to a market- driven system of private education, perhaps combined with vouchers? Which works better? You already know the answer. That is why, where it can, private or non-conventional delivery of primary education is growing by leaps and bounds. Do colleges, professors and their lectures have to be duplicated across the landscape or has the internet already created the capability for a better delivery system for most students? Again, you already know the answer. The more sinister view of course is that education and health-care, for example, are currently two of the largest service sectors of the U.S. economy. If you can nationalize them, then you may be able to secure their loyalty toward incumbent politicians and political parties. This is a wonderful outcome for politicians trying to consolidate political power and influence. Effectively, it is socialism built one brick at a time, not for ideological reasons, but for pragmatic political ones. The problem is, of course, that the provision of services by non-market sectors is so inept that it always attracts market competition and replacement. In the “normal” market case, advancing technology causes productivity to rise over time – that is a given amount of work or labor results in more output. Unlike this in a “non-market” sector we are likely to observe declining productivity—a baffling growth in jobs, work, and administrators coupled with a dismaying shrinking level of output. In fact, this is the best way to tell that you are looking at an emerging non-market sector. Low productivity is always used as a political excuse for the commitment of yet more resources, more employment, more controls, and more expenditure. Public education is a very good illustration. Spend more and get less. That’s because the primary goal of a political sector is typically lifetime employment and enfranchisement, not productivity. Get ready to hear the same argument for public healthcare. The list of how occupations and work will evolve naturally goes on and on. So what determines what the public, the final consumer, gets? Within a free market, of course, the public gets exactly what it wants. The occupations that can be replaced by a machine or algorithm will be, if and only if that reflects the changing desires of the market. Human provision of labor and services will remain or grow in those areas where that is what final consumers prefer. What is the endgame of an increasingly capital-intensive economy? Doing what economists do worst (forecast), I hazard some guesses in the final segment of this blog.